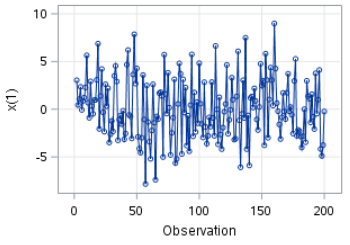 Once you have an approximate stationary time series, the next step is to look at the residuals and see if there is any remaining autocorrelation. If the residual is pure white noise, you're done! All of the correlation is explained by the model (i.e. differencing and transformation). If not, you might need to add an AR or MA term to correct the autocorrelation before getting to the final model. The TS1 data set contains our usual list of simulated values. One order of differencing is needed. 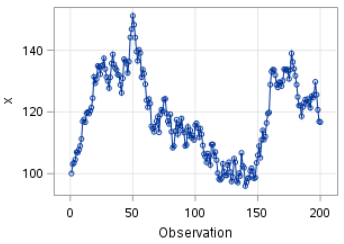 The mean seems to be stabilized with no obvious fluctuation in the variance. 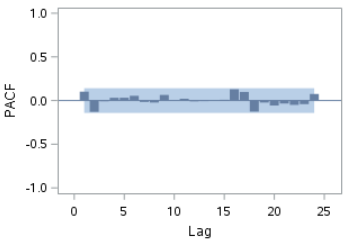 The ACF and PACF plots show no spike at any lag. The remaining residual (after differencing) looks like white noise. 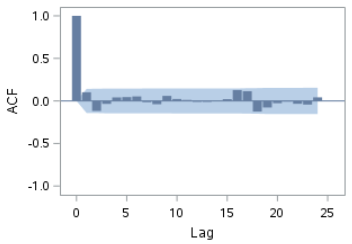 The p-values are above 0.05 at lags 6, 12, 18 and 24. We conclude that the residuals are white noise. We're done! All of the correlation seems to have been explained by the differencing. We have tentatively identified the model to be the ARIMA (0 1 0) model. In our example, the ARIMA (0 1 0) is the model that has one differencing order and no AR and MA term. Yt is just a random walk (white noise) away from Yt-1! In the next few sections, we will look at a number of examples where an AR or MA term is needed to correct the remaining autocorrelation in the residual. ​The STOCKS data set contains a list of stock closing prices for 100 days. Perform one order of differencing to stabilize the mean and check the Ljung-box test results. Can you conclude that the residuals are purely white noise?